What changes make the 2018 BMW X1 different? 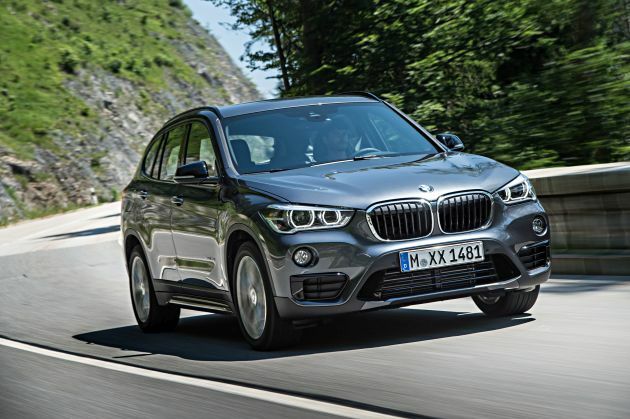 Minor equipment-package tweaks take care of changes to BMW’s smallest crossover in advance of a midcycle freshening for model-year 2019. A rearview camera is standard instead of optional on the ’18 X1, and the upcharge for any exterior color other than black or white is reduced to $550, from $700. The automaker also consolidates some feature packages as it prepares its premium-subcompact crossover for model-year ’19 updates to styling, equipment, and perhaps the engine. The ’18 X1 soldiers on with the look that accompanied its model-year-2016 redesign, when it became the first front-wheel-drive-based BMW offered in the U.S. More on that below, but today’s more spacious second-generation X1 has resonated with buyers. Sales are up 15 percent through the first five months of 2017, though that pace falls short of the 22-percent growth in a segment that includes that includes the Buick Encore, Lexus NX, Audi Q3, Range Rover Evoque, and the mechanically related Infiniti QX30 and Mercedes-Benz GLA. Should I buy a 2018 or wait for the 2019? Buy the 2018 if you like its looks and the prospect of saving some dough on late-model-year clearance sales as dealers prep for the freshened 2019 X1. You’d have to weigh those savings against buying a vehicle whose styling details and features set are about to become a bit dated. Still, the ’18 and ’19 X1 will have the same basic design, one that demonstrates the engineering change from BMW’s rear-drive tradition doesn’t deny this crossover top-notch manners. In fact, the more efficient front-drive packaging gives it best-in-class passenger and cargo room. The 2018 X1 again slots into the German automaker’s crossover lineup below the larger, compact-class X3. And continues to share its under-skin structure with the Mini Clubman from BMW’s British-brand offshoot. The ’18 X1 lineup reprises the front-wheel-drive X1 sDrive28i and the all-wheel-drive (AWD) X1 xDrive28i. Both return with a turbocharged four-cylinder as their only engine. This year’s option-package revamp simplifies ordering, but myriad standalone and packaged extras still enables you to customize an X1 to your taste. Be judicious, though: checking all the boxes can launch the sticker price into low orbit. Wait for the 2019 refresh to get the latest in X1 fashion and function – albeit at higher prices. BMW won’t alter the X1’s understructure, and won’t change its styling beyond a nip and tuck to the nose and tail. Do expect new color choices, new wheel designs, and maybe upgraded interior details. The ’19 X1 will again be among the numerous BMWs with a version of the automaker’s excellent 2.0-liter turbo four-cylinder engine, though a little more oomph may be on tap, perhaps an additional 20 horsepower or so, to around 248. Even without an engine upgrade, the ’19 X1 would likely remain among the quickest premium subcompact crossovers. Any additional power is welcome if it doesn’t hurt fuel economy, but BMW is more likely to concentrate its higher-performance focus in this class on its upcoming X2. Slicing the premium-subcompact-crossover niche even finer, the 2019 would borrow the X1’s architecture and mechanicals but wear a four-door fastback body. It’s an echo of the coupelike X4 derivation of the boxier X3. No change to shape, size, or detailing. BMW hadn’t release the list of available 2018 colors in time for this review, but it does note it’s cut $150 from the price of any metallic paint hew, which in the past has meant anything other than basic black or white. Otherwise, the ’18 X1 will carryover a shape that’s more mainstream than its sportier, and smaller, rear-drive first-generation predecessor. It aligns with Audi’s Q3 as a conservative design compared with that of the class rivals from Infiniti, Lexus, and Mercedes. The squared-off profile benefits interior space: for a vehicle this size, passenger and cargo room are outstanding. The seats are comfortable and supportive. The sliding and reclining rear bench is a welcome convenience. BMW hadn’t released full 2018 price and equipment details in time for this review, but we hope it stops treating that feature as a $300 option. Instruments and controls follow BMW’s no-nonsense school of design. The large infotainment screen atop the dashboard is crisp and easy to read, while the iDrive control system is more functional and responsive than ever. Connectivity is good, though we hope the 2019 feature-package shuffle means full smartphone integration is now standard. Not for 2018. The X1 that debuted for ‘16 marked a significant departure from BMW’s traditional design and engineering ethos. Instead of adapting the vehicle from one of its own rear-wheel-drive cars, such as the 3 Series, the company adopted a front-wheel-drive understructure developed for its Mini division. Yes, the second-gen X1 trades some of the handling prowess and 50/50 front/rear weight balance afforded by a rear-drive design. There’s a bit more body lean in fast turns in the X1 than you might expect, but steering response and grip, are still quite good. Overall, road manners are entirely consistent with what buyers in this class expect and are in fact better than any number of other front-wheel-drive vehicles. You can fine-tune the experience thanks to BMW’s standard Driving Dynamic Control that automatically adjusts the drivetrain among four different settings. The returning 2.0-liter turbocharged four-cylinder has 228 horsepower and 258 pound-feet of torque. It mates with an 8-speed automatic transmission with a traditional shift lever rather than the fussier, electronic “beer-tap” wand in other BMWs. The engine furnishes good power with minimal turbo lag (the delay in throttle response before the turbo boost kicks in). BMW says xDrive AWD models do 0-60 mph in 6.3 seconds, which feels right to us. We haven’t evaluated an sDrive front-drive X1, but it’s likely a tad slower to 60 because it relies only the front tires for traction off the line. Torque steer, the tendency for a vehicle to pull to the side during full-throttle acceleration, could be an issue, too. BMW hadn’t confirmed 2018-model wheel and tire sizes, but it’s likely to carryover a setup that made 18-inch alloy wheels and all-season runflat tires standard, with 19s optional on the xDrive28i. 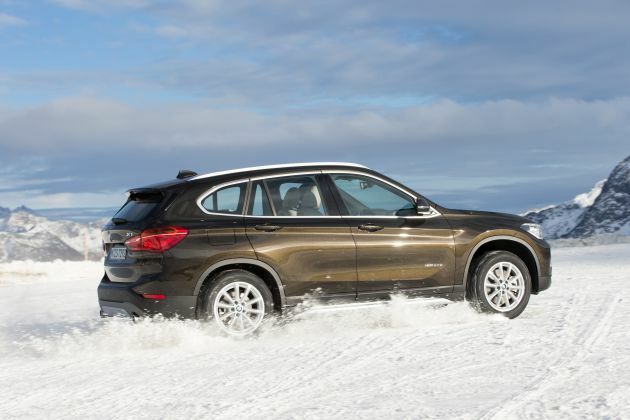 An xDrive X1 isn’t intended to go off road on anything more demanding than a deeply rutted gravel path, but it does boast 7.2 inches of ground clearance, second in this class only to the 8 inches of the AWD GLZ and QX30. And with the ability to enhance traction by automatically shuffling 100 percent of the engine’s power from the front wheels to the rears, it’s a reassuring advantage over 2WD in the snow. EPA fuel-economy ratings for the 2018 X1 were not released in time for this review. But given the absence of powertrain changes, they should repeat ratings that ranking the 2017 X1 among the more efficient premium compact crossovers. That means 23/32/26 mpg city/highway/combined with front-wheel drive and 22/31/25 with AWD. BMW strongly recommends premium-grade 91-octane gasoline, but mid-grade 89-octane can be used if none is available. To save fuel at idle, all X1s include a stop/start function that automatically shuts off the engine when the vehicle is stationary and automatically restarts it when the driver releases the brake pedal. BMW’s implementation here is far from the smoothest, as the engine restarts with a noticeable shudder. Thankfully, a dashboard button allows you to disable the system. The Cold Weather Package, previously a $550 option, is deleted and its contents shifted to other packages or become individual options. The Cold Weather Package had included a heated steering wheel and heated front seats. The Technology Package, previously $2,550, also has been killed and its contents redistributed to other packages. It had included such items as power-folding mirrors, a panoramic moonroof, automatic dimming interior and exterior mirrors, power driver’s lumbar support, LED headlights with cornering lights, and satellite radio. Packages that include driver-assist features such as autonomous emergency braking also are revamped. These encompass several packages that build on one another: the Driving Assistance Package (previously $1,150) with rearview camera and front- and rear-obstacle detection; the Driving Assistance Plus Package (previously $700) of lane-departure warning, forward-collision alert with pedestrian detection, and collision-mitigation braking; and the Driving Assistant Plus Package (previously $1,000) of full-speed, radar-based adaptive cruise control. Regardless of how these driver aids are reconstituted for 2018, expect that adding all will again make the X1 eligible for Top Safety Pick status from the Insurance Institute for Highway Safety. That’s one-tier down from Top Safety Pick+, an award that also considers headlight performance. For 2018, BMW creates an X1 Convenience Package, which includes visual upgrades over base-level trim, although it hadn’t released pricing and content. It also says the M Sport Package, previously $2,450, now includes all the Convenience Package content. The M Sport Package adds specific interior and exterior trim; a sport steering wheel with paddle shifters; sport seats; and performance suspension. For 17, the M Sport Package was a prerequisite to equip an xDrive28i with the 19-inch wheels and tires, which were a separate $600. For ’18, you will have to order both the Convenience and M Sport packages to get the Premium Package. A $3,250 option for 2017, it added a universal garage door opener with auto-dimming rearview mirror; keyless entry; lumbar support for the front seats; satellite radio; power-folding exterior mirrors; full LED headlights; and a power panoramic moonroof. As for standard equipment, it isn’t what you’d call generous — but this is true of most of X1’s rivals as well. The X1 does come with some notable inclusions, though, namely a power rear liftgate, rain-sensing windshield wipers, and driver-seat memory. Expect leather upholstery to again cost extra; it was a $1,450 option for ’17. The base upholstery is BMW’s SensaTec leatherette substitute that at least feels reasonably convincing. Base prices increase $800 while remaining competitive with those of most other premium compact crossovers, although a lavishly optioned X1 is likely to cost more than similarly equipped rivals. The 2018 X1 sDrive28i starts at $34,895 and the 2018 X1 xDrive28i at $36,895. Base prices include BMW’s $995 destination fee, which is unchanged for 2018. Among notable options, expect the Luxury Package (about $1,550) to again add leather upholstery and your choice of genuine wood or aluminum interior trim. 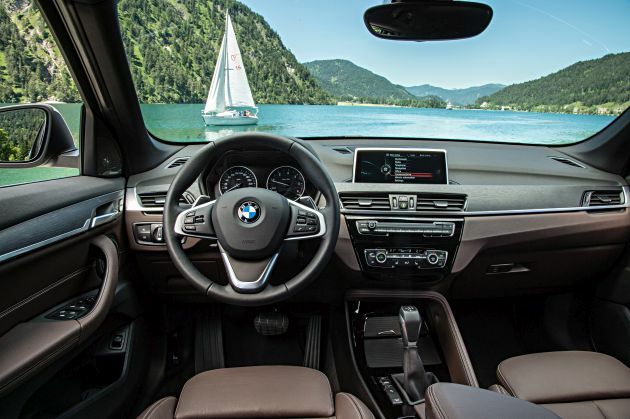 Ordering the $1,200 standalone navigation system should again open access to a head-up instrument display; real-time traffic data; BMW Online and BMW Apps with Connected App compatibility; a touchpad for the iDrive controller knob; and full smartphone integration. Those features had been included in the Technology Package. A la carte options should again include the panoramic moonroof ($1,350); sport seats ($500); smartphone integration ($350); sliding/reclining rear seat ($300); and a harman/karon audio system ($875). Release date for the 2018 BMW X1 is spring 2017. Aside from speculation about the model-year ’19 freshening, we’re pleased to see some reconsideration of options-package content for 2018, and hope it makes a smartly equipped X1 more affordable. Further, we hope the company reconsiders its model-year-2017 decision to pare back its complimentary scheduled maintenance program. This was a major selling point for the brand, and now it merely runs with its competitors. Instead of 4 years/50,000 miles of no-cost service that covered even wear-and-tear items, buyers now get a 3-year/36,000-mile program that still includes fluids and filters but not brake pads and discs, wiper blades, drive belts, and manual-transmission clutches. Full coverage is available for an extra charge.